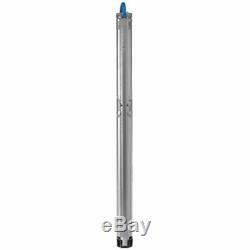 Grundfos 22SQE10-190 - 22 GPM 1 HP SQE-Series Deep Well Submersible Pump (190' Rated Head) (2W - 200-240V). Grundfos 22SQE10-190 - SQE Series 3 Submersible Well Pump (2W - 200-240V). Ideal for use with 3 I. 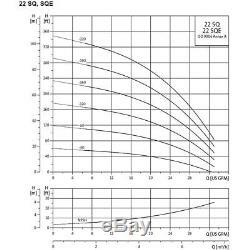 Please see documents for sizing / pump curve information. Requires Grundfos CU 301 Constant Pressure Kit (Not Included) (Model 96438895). Constantly adapts pump performance to meet the demand for water. Can provide constant water pressure from 40 -100 PSI. 1 HP Stainless Steel Grundfos "Smart Motor" (2-Wire - 200-240V). Variable-speed, electronically controlled, communicates with CU 301 status box. Allows for a low starting current with a smooth and steady acceleration. "Floating" Impellers w/ Tungsten Carbide/Ceramic Bearings. Allows for high wear resistance to sand which extends pump life. Provides added protection to motor/pump during start-up. Prevents damage to the motor if voltage moves outside rated range. Overload Protection & Overtemperature Protection. Reduces Motor RPM or turns off power to motor to prevent damage to motor. Built-in temperature sensor ensures optimum operating conditions for the motor. Lets you configure, control and alter pump settings with your Android/IOS device. They have expert technicians standing by to help solve your issue. Please have your model number and serial number available for fastest service. And we will respond within 24-48 hours. Customer Service hours of operation are 7am - 7pm CST, Monday - Friday. This listing is currently undergoing maintenance, we apologise for any inconvenience caused. The item "Grundfos 22SQE10-190 22 GPM 1 HP SQE-Series Deep Well Submersible Pump 190" is in sale since Monday, December 4, 2017. This item is in the category "Business & Industrial\Hydraulics, Pneumatics, Pumps & Plumbing\Pumps & Pump Accessories\Pump Parts & Accessories\Other Pump Parts & Accessories". The seller is "powerequipmentdirect" and is located in Bolingbrook, Illinois. This item can be shipped to United States.